Hand Select Best Available. I have a few with very minor issues. I personally look for the best available if you choose this option. Generally the larger dents you see in the photos, will NOT be on the Hand Select or there is only one or they are smaller compared to the Non-Hand Select. 3.875" Long Lug MFI HK G28 DMR Style Muzzle Brake / Barrel Extension for AR in 300 Blackout with 16" Barrel or any weapon with 5/8 X 24 thread to get to Ca OAL 30" or MD OAL 29" or a Featureless Ca. Semiautomatic Rifle. WARNING: ONLY FOR 300 Blackout. WARNING: The Exit Hole necks down to 0.348". 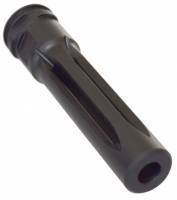 This Version of the MFI HK G28 Muzzle Brake is specifically made for the California and Maryland Markets to meet the California DOJ & MD minimum overall length of 30" or 29" for the AR in 300 Blackout Only and to qualify as a Featureless Ca. Semiautomatic Rifle. This item will fit ANY BARREL with a 5/8 X 24 Thread. Heat Treated to about Rockwell 30. .
Exit Hole I.D. 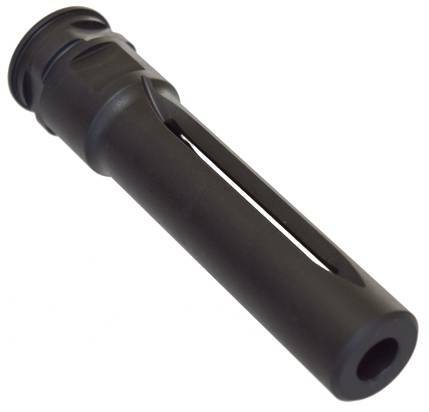 @ 0.348"
This item fits any weapon with a 5/8 X 24 threads WITHOUT ANY MODIFICATION. You do however need to remove the existing Flash Suppressor / Flash Hider / Muzzle Device.